WushuOntario coordinates a number of programs, workshops, accredited courses and subsidies to provide ongoing support and development for officials and volunteers. Officials are an essential part of sport. They should be given an opportunity to make a valuable contribution to the martial arts community by learning new skills through education, training and mentoring. It is important to create a respectful, appreciative and supportive environment for everyone participating, including spectators. A WushuOntario official is any person who controls the actual play of a competition by the application of the rules and laws of the sport to make judgement on the rule infringements, performance, time or score. These officials (e.g. umpire, referee, or judge) administer the their training to ensure the proper conduct of Wushu participation in a safe and well coordinated environment. The certification program begins with an introductory development clinic to become a Level 1 – Recreation Official with available upgrade program clinics to attain higher levels of certification; the highest being a certified International Wushu Federation Official. For a break-down on each certification level please refer to our Officials Certification Content page. Certification clinics are comprised of both theory, technical and practical components and consist of different content depending on whether the course is for Taolu or Sanda officiating. These clinics are available to organizations, clubs, and individuals. The goal of the clinics is to certify and develop officials both for Taolu and Sanda. All clinics must have a sufficient number of participants to allow for a full core of officials during the practical evaluation. Visit our Officials Clinics information page to learn more about the certification process. Clinic registrations will be posted on the Events Calendar as they become available and may also be administered upon request. In order to obtain the next level of certification, upgrade clinics must be successfully completed. For information on upgrading your certification to Provincial (Level 2) or higher, please contact us. WushuOntario officials ensure that the athletes and participants are abiding by the rules and playing in the spirit of the sport. They are also there to ensure that events are observed and enjoyed by all. -Opportunity for parents, enthusiasts or partners to be involved in sport. All you need is an interest in Martial Arts and a willingness to be involved. Below are descriptions of each level of certification for WushuOntario Officials, as well as information on next steps after becoming a certified Official. The first level in the WushuOntario officials’ development program, it is designed for any person aspiring to become a wushu official. The purpose is to enable the candidate to understand and apply basic rule interpretations associated with recreation competition divisions in Taolu or Sanda. Level 1 officials are allowed and expected to officiate as a first official WushuOntario sanctioned recreational competitions and tournaments; as well as work as administration to learn the processes of timing, score keeping, marshaling and equipment handling during events. Must perform adequately at a practical evaluation during 1-3 initiation events. Must attend a Certification Technical Clinic prior to participation in 3rd official event. Must become a registered member of WushuOntario via “Officials First” program. Must pass a Police Record Check and Vulnerable Sector Screening Check to be assigned to WushuOntario and WushuCanada competitions. In order to become a Level 2 Official, a candidate must have been active as a Level 1 Official for at least 5 recognized events or 50 bouts, and fulfilled all the requirements of the Officials Upgrade Program. The Level 2 Official is allowed and expected to officiate as sideline or panel judge during recreational, provincial championships and Ontario Winter Games. An official aspiring to be a Level 3 Official must have been active as a Level 2 Official for at least 3 recognized events and must apply for entry into the Officials Upgrade Program. The Level 3 – Official is recognized as a “senior official” and as such is allowed and expected to officiate at all competition levels in Ontario including qualifiers and National Championships held in Ontario. An official seeking Level 4 status must have been active as an Official for at least two years and must be recommended by the Officials Committee for entry into the Officials Upgrade Program. The Level 4 Official has the opportunity and is expected to officiate at all competition levels in Canada and is recommended to begin certification at the international level. IWuF level 1 equivalency is adapted at this level of certification. Level 5 Certification is the highest level attainable in the WushuOntario Officials’ Development Program. Only the top Officials from across Canada will be recommended for entry into the International Upgrade Program. Upon entry into Level 5 certification, officials must be prepared to officiate at the highest levels of Wushu throughout the province, country and world. Each year WushuOntario will recommend and subsidize its most active officials to attain, maintain and upgrade their certification under the IWuF officiating program. So you are now a certified WushuOntario Official, how do you get assigned to officiate events? Before you can be assigned to officiate events you will need to ensure you are on the most current officiating panel which is public record on the WushuOntario website. To officiate international events you will need to register with WushuCanada and be certified under the IWuF. These include participation at the World Championships, University Games, World Game etc. Note: In order to officiate in the WushuOntario events you will need to submit a Police Record Check, with Vulnerable Sector Screening to the WushuOntairo office. For details on the WushuOntario Screening Policy and how to obtain your Police Check, go to “How to attain a background check” tab. Upon registration as an Officiating Member of WushuOntario, officials will receive a welcoming letter along with digital copies of the most up to date rules and regulations. During their initial practical assessment at their first event they will receive an Officiating “Tie” along with a Passport and Badge. Standard Officiating Uniform consists of White Dress Shirt or Blouse, Black Trousers and Black Shoes. Wearing of the “Tie” is optional for female officials. 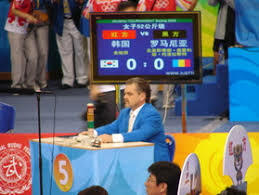 Platform/Centre referees may opt to wear a black “Bow” tie during events. Optional Officiating Uniforms may be available if agreed upon by the Officiating committee and provided for by Organizers of sanctioned events. These may be in the form of polo or collared shirts relevant to the particular event. At WushuOntario we strongly recognize the importance of our officiating team who dedicate their time and efforts to aid in the successful advancement of our martial art athletes. Launching in 2018 WushuOntario will deploy the “Officials First” program with several key initiatives. More often than not, officials can be considered as a sport organization’s most important volunteers. They put time, training, and impartiality into their passion for sport. Whether past coaches, athletes or simply enthusiasts, officials directly impact and determine the positive pathways in which our athletes progress. Subsidized membership for all registrants in the “Officials First” certification program. Your time and effort is a clear indication of your first commitment to pursuing your interest in the martial arts. -Theory: general understanding of Taolu or Sanda Class E/F regulations along with general knowledge in the differences among Taolu Events or Sanda Classes. -Practical: Commitment to participation in a minimum of 4 events per year. -Renumeration: Level 1 Certification is a voluntary commitment however, meals at events along with transportation arrangements are always arranged for officials and volunteers. 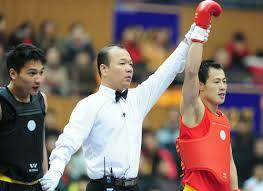 -Officiating welcome kit: Taolu or Sanda Rule Book, Official’s tie, Officiating Passport. -Recognition: listed as level 1 certified official upon completion of online course. -Technical Requirements: Application, Vulnerable sector check via WushuCanada, Online Level 1 applicable course. Honorariums, remuneration, upgrade subsidies and travel benefits begin at Certification Level 3. Police Record Checks and Vulnerable Sector Screenings. Follow the link below, create and access your personal account below and share results with WushuOntario for completion of official background check. WushuOntario requires mandatory Police Record Checks (PRC) and Vulnerable Sector Screening (VSS) checks for all individuals in leadership roles who work directly with athletes. This includes all Staff, Directors, Chairs, Coaches, Managers, Officials, Chaperones and persons who manage finances. Screening of personnel and volunteers is an important part of providing a safe sporting environment and has become a common practice among sport organizations that provide programs and services to the community. WushuOntario is responsible at law, to do everything reasonable to provide a safe and secure environment for participants in its programs, activities and events. WushuOntario takes very seriously, and is committed to, fulfilling the duty of care it owes to its members. WushuOntario requires each person to submit a PRC and VSS once every three (3) years from the date of completion, upon which time you must submit a new PRC/VSS. The process is super easy via our partnership with mybackcheck.com.